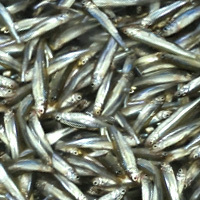 Wakasagi or Japanese pond smelt is a small fish found in rivers and ponds in Japan especially in Hokkaido in places such as Lake Toya. It is used in tempura and many fried dishes. To catch wakasagi, butterworm is commonly used. The calories in Wakasagi per 20g(1fish small approximate) is 15 calories. Wakasagi is calculated to be 77Cal per 100 grams making 80Cal equivalent to 103.9g with 2.88g of mostly protein、0.34g of fat、0.02g of carbohydrates in 20g while being rich in vitamins and minerals such as Vitamin B12 and Selenium.